Any brewery taproom will have space for patrons and beer: countertop bars, tap rooms, restaurant dining rooms, private tasting rooms, open beer halls, private event or banquet halls, and/or entertainment areas. Depending on your brand and facility capabilities - there may be an outdoor beer garden or the taproom may accommodate brewery tours. There will be restrooms, storage and may be employee break, conference, office, kitchen and wait staff space. Classifying the various programmed spaces allows us to determine occupancies, required separations and occupant loads. 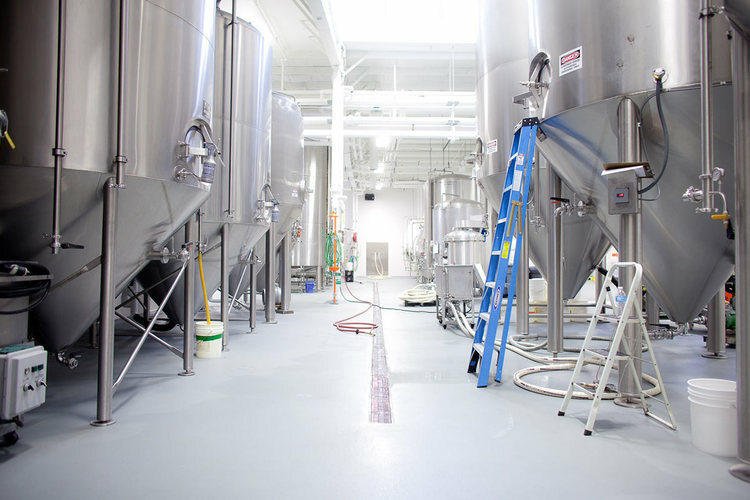 Looking to design a new brewery taproom, distillery, restaurant or renovate your existing facility? As the program is defined, we are able to determine the Occupancy Classifications. Projects in Indiana are governed by the 2014 Indiana Building Code (IBC) which is comprised of the 2012 International Building Code. At Upland Fountain Square in Indianapolis we designed a large beer cooler (almost 400sf) at the core of the assembly space - front and rear bar areas and two outdoor service windows surround the cooler, which facilitates keg storage, taplines, merchandising and service doors, tap menus, television mounting and glassware shelving. In Indiana, restaurants that allow minors and serve beer must separate those areas as part of 905 IAC 1-41-2 Separation of rooms: “the separation of the bar area from the dining area, where minors may be served, may be a structure or barrier that reasonably deters free access and egress without requirement for doors or gates” There are additional food sale minimum requirements to allow for the separation. Depending on the height of the barrels/racks, high pile storage requirements could be in place. Occupancy classification plays a key part in organizing and prescribing the appropriate protection measures. As such, threshold requirements for fire protection and means of egress systems are based on occupancy classification. This Web Site, its content (including any information provided by users) is for informational purposes only and is not intended to replace or substitute for any professional code or other advice. In addition to the “Disclaimer/Limitation on Liability” paragraph above, the Company Entities and Individuals make no representations or warranties and expressly disclaim any and all liability concerning any treatment or action by any person following the information offered or provided within or through the Web Site. If you have specific concerns or a situation in which you require professional advice, you should consult with an appropriately trained and qualified code specialist.